The purpose of this study is to gain a holistic view of the NGS market in terms of various influencing factors, such as trends, technological advancements, role of service providers, and funding scenario in the market. The scope of this report constitutes of an in-depth study of the global next-generation sequencing market, including a thorough analysis of the products across different regions. The market has been segmented into ‘technology’, ‘product’, ‘application’ and ‘geographical regions’. The report presents the reader with an opportunity to unlock comprehensive insights with respect to the market and helps in forming well-informed strategic decisions. The research uncovers some of the substantial parameters that must be taken into consideration before entering into the market. 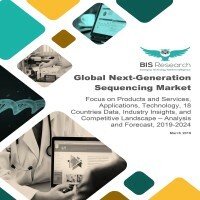 This research report aims at answering various aspects of the global NGS market with the help of key factors driving the market, restraints, and challenges that can possibly inhibit the overall market growth and the current growth opportunities that are likely to shape the future trajectory of the market expansion. The report includes an in-depth examination of the key ecosystem players and key strategies and developments taking place in this market. In addition, the report includes market dynamics (market drivers, opportunities, and challenges) and industry analysis. The research study considers the market share analysis for a comprehensive understanding of the global NGS market and assesses the factors governing the same. Funding scenarios, Porter’s Five Force analysis, opportunity matrix, detailed product mapping, pricing analysis, value chain analysis, supply chain of NGS kits and consumables, growth share analysis by products and sequencing instrument provider, and R&D analysis have been included in the report. • What is industry’s best value chain practice? • How has the market been segmented on the basis of sequencing technology? Which NGS technology is being adopted extensively for undertaking the sequencing procedure? 3.4.2 Value Chain Analysis: Illumina, Inc.
5.2.1.6 Pacific Biosciences of California, Inc.
5.2.1.7 Oxford Nanopore Technologies Limited. 5.2.1.9 New England Biolabs, Inc.
9.13 Pacific Biosciences of California, Inc.
Table 5.4: Few Suppliers of QIAGEN N.V.
Table 5.5: Few Suppliers of PerkinElmer, Inc.
Table 5.6: Few Suppliers of Pacific Biosciences of California, Inc.
Table 5.7: Few Suppliers of Oxford Nanopore Technologies Limited. Table 5.8: Few Suppliers of NuGEN Technologies, Inc.
Table 5.9: Few Suppliers of New England Biolabs. Table 5.10: Key Offerings of Illumina, Inc.
Table 5.11: Few Suppliers of Illumina, Inc.
Table 5.14: Few Suppliers of ASURAGEN, INC.
Table 5.15: Few Suppliers of Agilent Technologies, Inc.
Table 5.16: Few Suppliers of Adaptive Biotechnologies. Figure 3.14: Value Chain Analysis: Illumina, Inc. In the past few years, genome of several species has been sequenced using the automated sanger sequencing. There have been limitations associated with the sanger sequencing, leading to the development of improved sequencing technologies that are capable of sequencing a large number of human genome and are also capable of addressing the problems that were initially hindering growth of the next-generation sequencing (NGS) market. Further, several research centres initiated the designing of the new sequencing technologies which would not require gels and would allow sequencing of a large number of samples in parallel. The three parallel technologies that were introduced in the early 21st century are Polonator, the Heliscope Single Molecule Sequencer Technology, and the Ion Semi-Conductor (Torrent Ion Sequencing). Since the introduction of these technologies, several attempts were made in the past to generate efficient sequencing technologies that would rely on single molecules, excluding the need for amplification steps. The two promising such technologies are Pacific Single molecule real time (SMRT) DNA sequencing and nanopore DNA sequencing. The advent of aforementioned technologies has unleased some novel methods which hold the potential to make the $100 genome dream a reality in the near future. These high-throughput sequencing methods have introduced new fields in the industry, which include analysis of RNA transcript, personal genomics, ChiP-Seq (Chromatin Immunoprecipitation sequencing), and ChiP-chip (Chromatin Immunoprecipitation coupled to DNA microarray), among others. The purpose of the study is to gain a holistic view of the next-generation sequencing market in terms of various influencing factors, such as recent trends, technological advancements, and regulatory aspects of the market. The scope of this report is centred upon conducting a detailed study of the technologies allied with the next-generation sequencing market. The global next-generation sequencing market is segmented on the basis of four sections, namely product, technology, application and geography. The global market value was estimated using these four different approaches and was validated with one another. These segments are further segmented into several sub-segments to ease the market estimation and to gain an in-depth view of the market. A paradigm shift in the dynamics market is expected in 2023 with the introduction of portable technologies in full scale. The leading players in the market are taking necessary steps to tackle the shift in the dynamics and sustain in the competition. The global next-generation sequencing market is majorly dominated by the U.S. players. Companies belonging to the U.S., such as Illumina, Inc., and Thermo Fisher Scientific, contributed to more than 70% of the market value in 2018. The key players which have significant contributions to the NGS market are 10x Genomics, Agilent Technologies, Inc., bioMérieux SA, Bio-Rad Laboratories, Inc., Danaher Corporation, F. Hoffmann-La Roche AG, GenapSys, Inc., Illumina, Inc., New England Biolabs, Inc., NuGEN Technologies Inc., Oxford Nanopore Technologies Limited, Pacific Biosciences of California, Inc., PerkinElmer, Inc., QIAGEN, and Thermo Fisher Scientific, among others. The field of service providers for sequencing tests and the applications based on genome sequencing are perceived to be a lucrative business across the globe. With the impressive rise in the demand for sequencing-based diagnostics applications, namely non-invasive prenatal testing, companion diagnostics, and liquid biopsy, the service providing companies have gained popularity and acceptance across the globe. Additionally, substantial investments are being made in bioinformatics startups and service providing companies. With the growing demand for genome mapping programs, a large pool of genomic data is being generated, and the key players of the market are seeking help from the bioinformatics startups to meet the market requirement. Service providing companies help in expanding the global reach of the key players of the market and also play a significant role in increasing the adoptability of sequencing technologies across the globe. Some of the opportunities on which significant work is being carried out presently in the market are hybridization of technologies and development of portable technologies. The best sequencer is the one with the ability to sequence long reeds, in short run time and with great accuracy. The present available sequencers on the market possess any one of the mentioned features, but not all three. In spite of the substantial investments made by prominent companies to develop the instruments with the aforementioned features, it is not expected to be the reality at any time soon. Thus, the hybridization of available technologies, such as SMRT and reversible semiconductor sequencing technology, is acknowledged to be a promising approach to cater to the needs of the market.